A company that appreciates its stakeholders puts thought into the gifts it hands out to them. Unique and engaging corporate keepsakes make for memorable and enduring associations. At Engrave Awards & More, we specialize in outstanding merchandising ideas for corporate houses that care. The coaster sets we have on offer are a striking example of personalized and custom-made tableware that’s a class apart. They are cheerful, extraordinary, and make wonderful conversation pieces. Welcome to a world of company logo printed, customised coasters at Engrave Awards & More. Customization to a very high degree. Tell us what kind of graphic design you want on it, and we’ll do the needful. Since the material is acrylic, they are easy to clean. They are designed to make a great impression for years. The right side up of these coasters is printed with a high-gloss finish. This is done to make them more durable and easy to clean. The malleable nature of the material also allows us to create these coasters really quickly. Printed on one side with an anti-skid rubber silicone back, these coasters are attractive, inexpensive, durable, convenient, and easy to maintain. Lightweight and easy to clean. Quickly fabricated and delivered. Plus, they are inexpensive and attractive. All said and done, the benefits of these coasters are numerous. Perfect when you are on a tight budget and want to make a good impression. Stainless steel coasters are unique. The top is customized using the best-in-class printing technology. They look and are premium. The surface is easy to clean. The design is modern. Natural cork that is harvested by peeling a thick layer from the bark of the Cork Oak tree makes these coasters. They are lightweight and eco-friendly. What’s more, they can absorb moisture most easily and are easy to maintain. 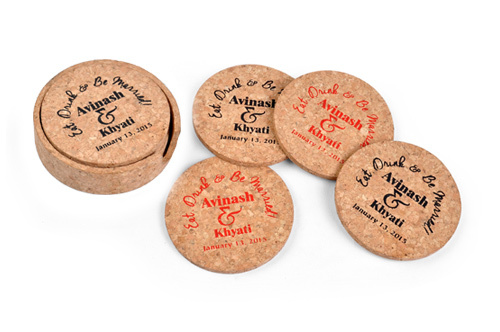 Made using high quality Steamed Beech Wood, these coaster have a premium look and feel. Customisation through laser engraving is possible on both sides of coaster. Since they are made of natural wood, they do get soiled over time, however they make for a great gift and look extremely classy. Created by Bulbul Sarkar, they are made from the smaller fallen branches of the acacia trees in West Bengal. The natural and rustic finish makes them unique and attractive to aficionados with a taste for the earthy and ethnic. Of course, if you are looking for something else in unique, custom printed coasters with logo... Call Us and we'll customise it to your needs!